I realized the other day that I hate walking on sidewalks. I would much rather saunter alongside the road in my established campus neighborhood. I remember when sidewalks seemed like a luxury. A place where one could ride a scooter and roller blade. Rural route kids don’t need, or can’t really use, roller blades-so I never had any growing up. Good thing too because looking back on my few experiences with roller blades, I probably would have broken my ankle. I thought to myself, so why today do I have this aversion to sidewalks? Is it because during the winter the roads were plowed more often than people shoveled the walks? Not relevant now. I thought is it because there are puddles when it rains? Not so right now (but maybe if I wait an hour or two…). Finally, I realized that for almost 19 years I never had sidewalks at my disposal. The road was where we would walk, ride bicycles, sled in the winter and even play tennis in the summer–keeping a careful eye and ear out for any cars that might drive by. I guess today old habits die hard and I don’t like be relegated to my own, devoted space for such acts like walking to my car–that is on the road. Its funny how these rural tendencies carry through today, in such an utterly bizarre way. 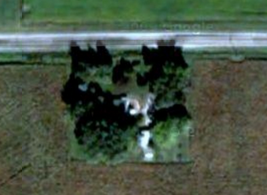 Google Maps Picture of My House. Take note: there is no sidewalk parallel to the road!